North America Bengali Conferences (NABC) have started to develop the same look and feel irrespective of where it is held. This year, the MTCC convention center in Toronto Canada looked no different than the Baltimore Convention Center of 2011 or the Atlantic City Convention center of 2010. Although this year the organizers have cut down on the decor part significantly, the stages are not like the dazzling spectacles of the previous years, and you can hardly see cut outs, paintings and signs strewn around the place. But as far as the pandemonium goes, the feel was exactly the same. On the opening evening (Friday) hardly any of the organizers were seen around. Maybe they were all busy getting ready for the play. No shuttles were provided to transport the guests from their hotels (as promised) and the trek down from the area hotels to the convention center was not at all pleasant in the rain with all the construction going around. Hence I missed the opening ceremony. After another bout of struggle at the registration booth, when I entered the Raja Rammohan Mancha, deja-vu struck again. The overseas performers, whom we have been listening to over the past few years, were once again singing the “Olden Golden” Bengali songs of the sixties and seventies with the obligatory nostalgo-romantic narrations in between. Little while later, I slipped into the vendor area – and the same Gold Jewellers, the sari stalls, Zee Bangla, Muktadhara, and Biswas stalls. I hung around for a while at the DuKool stall to support the cause of the magazine and in the process met few old friends. Some of them were complaining that food coupons have been sold out (which incidentally must be purchased apriori from three stories above) and they were frantically looking for food. The next event (of my interest) was the play “Dildar” presented by the organizing group and directed by Meghnaad Bhattacharya. The play was presented in a style which is not very prevalent in modern theatre, but the cast seemed to have worked hard to present a good show. Kaushiki Chakrabarty’s classical rendering was wonderful as usual although she could have skipped the gimmicks in her semi classical renditions. The second day was no different either, although the shuttle services seemed to have resumed their services. The highlight of this day was, as far as I am concerned, meeting some of my old friends from the TCS days in Delhi and Kolkata. I also bumped into many other friends and family members from different parts of the continent. Had some great “adda” sessions, and made some new friends. 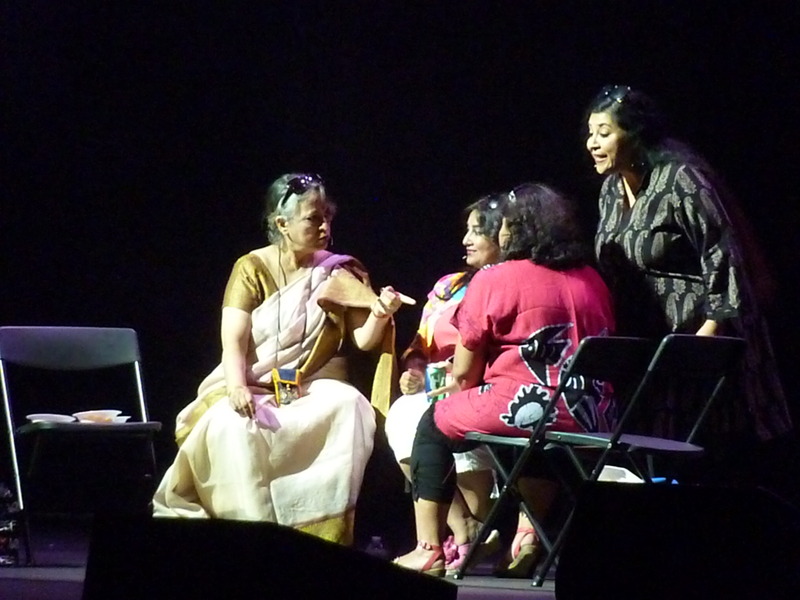 That evening Kallol of New Jersey presented their play “Musical Chair”, an all women play (well almost) on the main Raja Rammohan Roy stage. I had a special interest in this play, since I happened to be the writer. All I can say is that the Kallol team should be praised for having the courage to put up this play in NABC. A controversial and layered play like “Musical Chair” is not the kind you’d expect to see on a stage where entertainment is the priority. The subtext of the play gets diluted in a sea of people who are waiting for the next overseas entertainer to come on stage. Nevertheless, the team tried their best under the given circumstances and the feedback from the few serious theater lovers seemed to be mixed. The other attraction of the evening was the star studded play from Kolkata, “E Aboron”, directed by Dulal Lahiri. The play had all the right ingredients of an entertaining theatre – popular film stars like Locket Chatterjee, Saheb Chatterjee, stage actors like Meghnad Bhattacharya and Dulal Lahiri, song, dance, melodrama and a good story line. The audience loved it. On Sunday, I spent most of my time in the Literary Seminar room. The day opened with a panel discussion on women writers in Bengali literature. 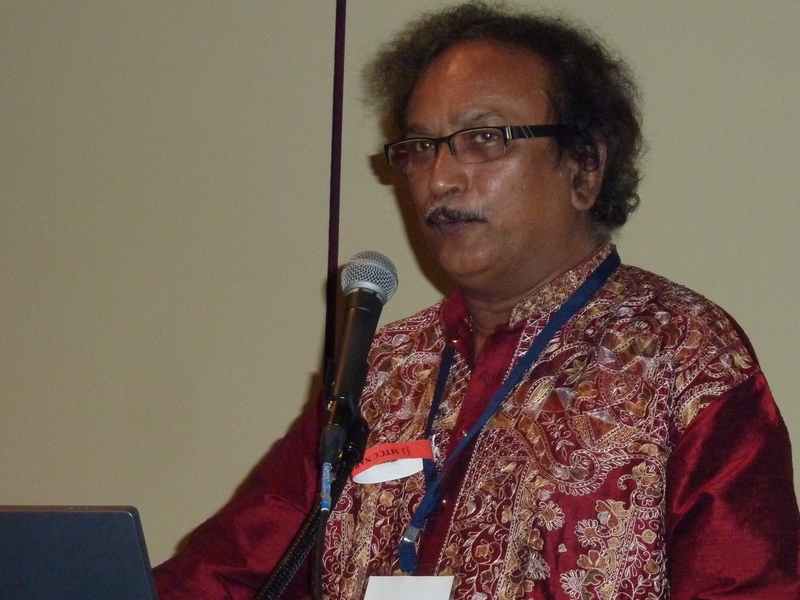 The panelists included writers from Bangladesh and West Bengal. The next session featured Parvati Baul who explained the nuances of Baul life and philosophy with an audio visual presentation. This was followed by an hour long lecture by Meghnad Bhattacharya on Bengali Theatre which was not only engaging but also extremely insightful. The session concluded with a panel discussion in memory of Sunil Ganguly. Several close friends and acquaintances (like Kanti Hore, Alolika Mukherjee, Tridib Chattopadhyay and others) of Sunil shared their experiences and fond memories with their beloved writer and friend. The literary seminar has always been the most neglected and least attended sessions of any NABC, but it always happens to be the most enriching experience. Kudos to Lalima Sarkar for pulling this off in such a shoe-string budget. The final event of the day was a mesmerizing performance by Shreya Ghoshal. She is undoubtedly the most talented singers of her generation, and her pleasant “girl-next-door” demeanor made her the darling of NABC. The long wait (for more than 3 hours for some people) was worth it. But do we really need someone like her for NABC? The huge expense is not the only issue here. The immense logistical arrangement required for a concert of this stature is not NABC’s cup of tea as it has been made evident time and again. It requires a completely different kind of setup and professionalism, and that is not what one can expect at NABC. Hence future NABC organizers should think twice before hosting a performer like Shreya. I don’t think the seminars were recorded. I did not see any camera around. As for Meghnaad Bhattacharya’s comments, stay tuned and most likely you’ll hear something soon. Very nice write up on NABC2013. Enjoyed reading it. Keep it up. Awesome write-up and great briefing. I was looking for a way to communicate but I couldn’t find an option. I was one of the overseas artists at the NABC 2013 though nearly nobody heard me coz I was performing on the 7th July afternoon which was just after the night when everyone went home at 3am and came back late afternoon for the big performance performance later on the 7th. With a heavy heart I started performing but whatever audience I got gave me a heart warming welcome and wasn’t letting the curtains to close, coz they wanted to hear me more. This made me forget all the emptiness I had seeing an empty audience. Just wanted to share this. Anyways I am on my way to New York and New Jersey for a holiday till the 25th of July. Do let me know if there are any events taking place. I would feel lucky to be able to perform and bring good music to the ears of the Bengali Community here. Looking forth to hear back.